You know me, I’m not one for tons of fluff and fancy stuff. But I do have some room for a little bit of whimsy in my life. And when I think “whimsical,” I think about a lot of things: unicorns, rainbows, fairies, glitter, and sometimes all of those things mixed together. But mostly, unicorns. Did the unicorn trend seem to magically appear out of nowhere recently? I guess that’s the magic of unicorns, isn’t it? Wherever it came from, I’m not complaining. I don’t think I’m alone in my love for all things unicorn, either. From unicorn mugs to hats and from backpacks to spoons, I’ll take my touches of magic wherever I can get them. 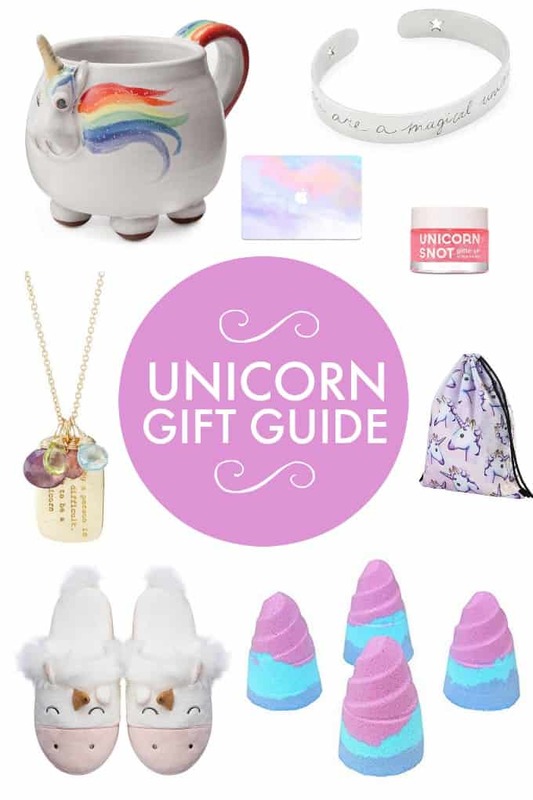 In this unicorn gift guide, you’ll find a mix of everyday useful items (like slippers) and then those not-so-useful-but-still-really-fun items (like a subscription box full of colourful unicorn goodies). I hope you’ll find this gift guide not only makes your shopping easier but brightens your day as well. 1. Unicorn Crate. Subscription boxes are THE BEST. This Unicorn Crate from Cratejoy is no exception. Shipped monthly right to your door, this box features one new hardcover YA fantasy novel, five to six accessories that complement the novel, and one unicorn item. 2. Elwood the Rainbow Unicorn Mug. Is there a better name for a unicorn than Elwood? I challenge you to come up with anything to top that. The mere thought of waking up to an Elwood rainbow unicorn mug filled to the brim with piping hot coffee is enough to bring a smile to anyone’s face. 3. Unicorn Pony Cuff. It’s one thing to tell yourself you are a magical unicorn pony. It’s a whole other thing to wear that phrase around your wrist…but a good thing for sure. The artist who created the sterling silver cuff wanted you to easily be reminded of the magic of every day. I’d say this does the trick in the most adorable way. 4. Time To Be A Unicorn Necklace. If you like to wear your magic close to your heart, then this necklace is for you. The centerpiece charm features a 22k gold vermeil pendant with the quote “Being a person is too difficult. Time to be a unicorn” etched into it. It’s surrounded by four gemstones meant to promote positive energy wherever you go. 5. Unicorn Winter Hat with Scarf Pocket Hooded Knitting Beanie. This winter hat is no run-of-the-mill accessory. Sure, it keeps your head warm, but it also serves as a scarf and a hand warmer and it is shaped like a unicorn. Need I say more? 6. Unicorn Animal Slippers. Slip these cozy, sleeping unicorn slippers on your feet, sit back, relax, and have a magical evening. 7. Primitives by Kathy Box Sign. Sometimes we need a little reminder that it’s okay to be ourselves. Unless, of course, we can somehow turn into unicorns. Then we should most definitely choose that. 8. Unicorn Snot Holographic Body Glitter Gel. I admit, I’m usually averse to anything labeled “snot.” But, in this case I can handle it since it’s unicorn glitter snot. I imagine when you wear this body glitter it looks like a unicorn just sneezed on you. Which is perfectly acceptable. 9. Ababalaya 3D Print Drawstring Backpack. These simple drawstring backpacks are everywhere. They are great for holding a few items for the pool, sports, school, the amusement park—you name it. Add unicorns to it and what you have is a drawstring backpack you can wear with a smile. 10. Unicorn Bath Bombs. Brighten up bath time with these pretty unicorn bath bombs. They fizz, foam, moisturize, and make great gifts. Add them to a stocking, a gift bag, a party favor bag, or give the set as a gift all on its own. 11. Hand Stamped “Unicorn” Spoon. Stir your coffee, tea, or cocktail with these pretty purple stamped spoons. The perfect accompaniment to Elwood the unicorn mug, if you ask me. 12. Unicorn Magic Marble MacBook Case. Your MacBook won’t get lost in the shuffle anymore once you personalize it with this unicorn marbled, pretty pastel matte case. 13. Unicorn makeup bag. Store your makeup, pencils, art supplies, or other necessities in this darling unicorn-patterned, zip-up bag. 15. UNICORN Whipped Body Butter Lotion. Smother your skin in this beautiful unicorn body butter. Handmade and available in two sizes, this whipped moisturizer arrives in pastel pink, blue, and yellow with just a touch of magical unicorn glitter for good measure. For more gift guides, check out this Disney gift guide, gifts for beauty lovers, gifts for coffee lovers and gifts for book lovers. What unicorn gift is your favourite? How cute are those slippers? I die!